The news: There are only two weeks left to go until the World Cup kicks off in Brazil — and things couldn&apos;t be more unsettled. On Tuesday, a group of 1,500 indigenous protesters took to the streets and clashed with the police in Brasilia, the country&apos;s capital. Several people tried to gain access to the Brazilian Congress to argue with lawmakers, while the police fired tear gas into the crowd. Some protesters responded by hurling stones and shooting arrows; two protesters and one police officer were injured. This comes at the heels of last week&apos;s protest, where hundreds of teachers demonstrated before Brazil&apos;s national soccer team, which was heading for training. 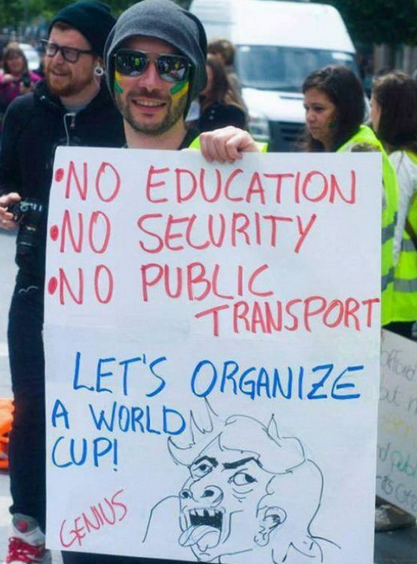 "There will be no World Cup, there will be a strike," they chanted as they surrounded the players&apos; bus. The background: The indigenous people&apos;s protests began over federal proposals to demarcate their land — a move that follows the forced evictions of people who lived around the World Cup stadium area without formal land titles. Similar protests have focused on land insecurity issues; earlier this month, tens of thousands of people from Brazil&apos;s Landless Workers Movement took to the streets to protest the investment in new infrastructure, arguing that it&apos;s not sustainable and won&apos;t actually improve the average Brazilian&apos;s life. As for the teachers, they have been protesting since May 12, calling for better pay and working conditions. They have also decried the amount of money spent on the World Cup and have argued that the money could have been invested in Brazil&apos;s public school system. The country&apos;s civil police have also walked off the job to demand for higher wages in 14 cities — six of which are hosting the World Cup games. And federal police have threatened to strike again during the games if their demands are not met. "If the government does not show willingness to negotiate, we do not rule stopping during the Cup," said Marcelo Novaes, the police union&apos;s president in Rio. Bad publicity: And even Brazil&apos;s biggest soccer stars are lending their weight to the public discontent. Earlier this week, retired legend Ronaldo criticized the underlying infrastructural problems that have led to the World Cup chaos, though he declined to blame FIFA. "This is what people should understand: it&apos;s down to governments. The governments they have elected. It&apos;s nothing to do with football or the World Cup," said Ronaldo, who is currently serving as a FIFA ambassador. The sentiment was echoed by the 72-year-old icon Pelé, who argued that the money could have been better used to fix existing problems. "It&apos;s clear that politically speaking, the money spent to build the stadiums was a lot, and in some cases was more than it should have been," he said. "Some of this money could have been invested in schools, in hospitals. ... Brazil needs it. That&apos;s clear."